The indic8tor is a sub £100 speed camera warning device that has got me very excited. Verbal warnings, speed-limit cut-offs, smart direction software, latest GPS receiver - this sounds too good to be true. Lets see! 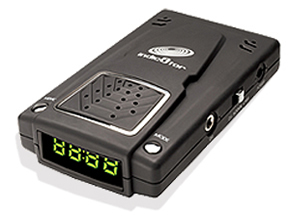 The indic8tor is a GPS based safety camera detector. That is to say it has a map in its memory with all the fixed position speed cameras and lots of the common temporary ones. It compares this map your position using a Global Positioning Satellite Receiver built into the top of the unit, your speed, direction, and the speed limit and direction of the camera. It will not warn you if the police aim a laser gun at you, or a mini-gatso, but the devices that do may become illegal, so the indic8tor is a safe bet. To review and test this Speed Camera detector I plugged it in, waited for the greeting and headed off to the local series of safety cameras, two truvelos within a mile of each other. The unit was very impressive with how it warned - it tells you what type of camera you are approaching and the speed limit, beeping as well. It starts warning at about 250 yards, but this can be changed. If you're going under the speed limit you don't get all the commotion, which leads to much more relaxed driving. Impressed, I went past a local lay-by where mr. plod often parks up in a white van. The indic8tor bleeped away, warning me. Impressive. The unit itself looks the part, and sits well on the dashboard of my car. You do have to pay a subscription fee for the latest maps, but this works out at less than £3 a month, and when you think about how much a speeding fine, and increased insurance, £100 for the device and £30 a year is a bargain. The best budget GPS speed camera detector? It is so far, especially when you think how much more expensive the Road Angel devices are! Buy one now!